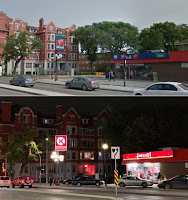 Couche Tard's rebranding of its Mac's Convenience Stores over to Circle K appears to have finally arrived in Winnipeg as Erin noticed earlier this week in Osborne Village. With it, another familiar name disappears from the local retail landscape after nearly 50 years. 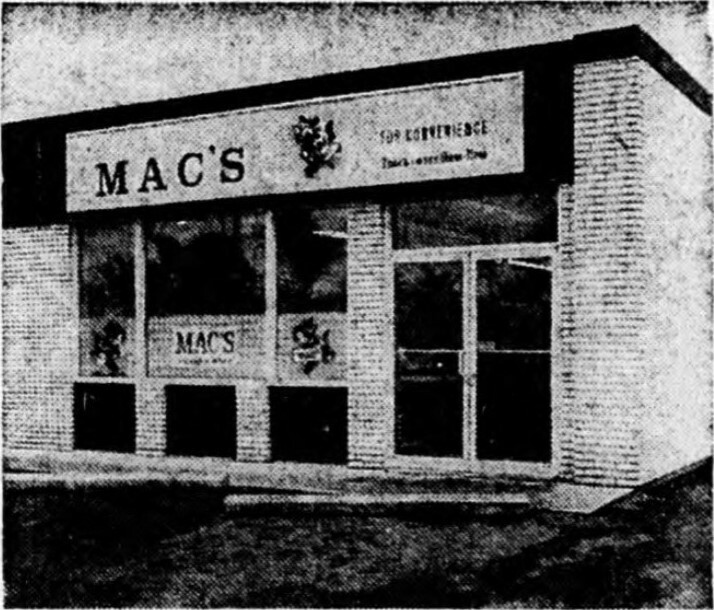 Mac’s entered the Winnipeg market in 1970 by taking over the 13-location Kwik Shop chain created by Jim Penner in the late 1960s. 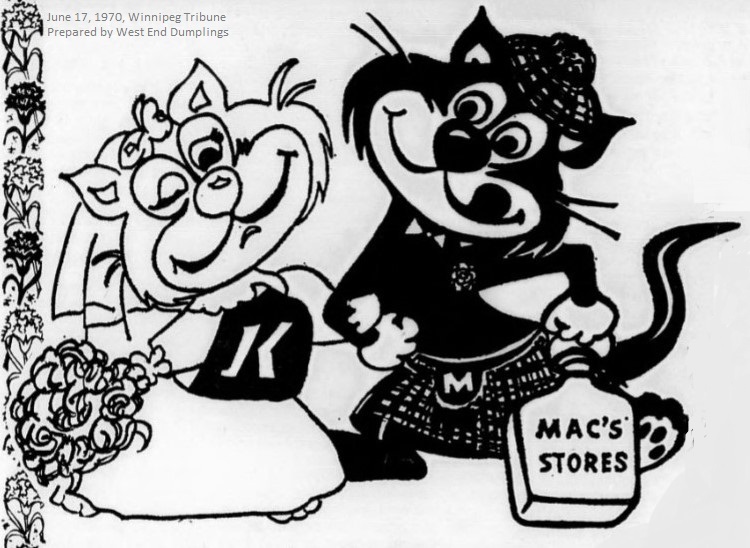 The stores were rebranded and a grand reopening sale celebrating the "marriage" of mascot MacTavish the Cat to a Kwik Shop cat began on June 17, 1970. The retailer, by this time owned by Ontario dairy company Silverwood Industries, had been contemplating a national expansion for some time and chose Winnipeg as its first target outside of Ontario in order to head off the arrival of 7-Eleven in Western Canada. 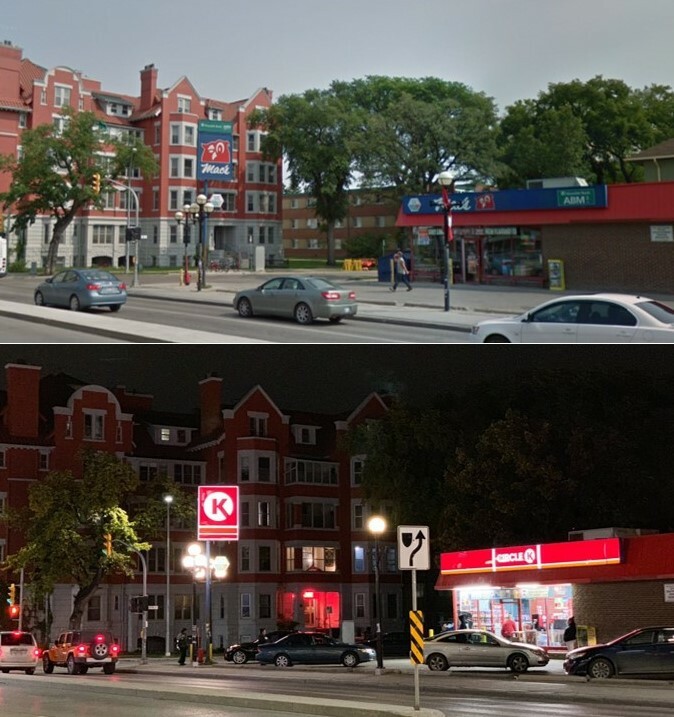 The Texas-based 7-Eleven had over 3,000 stores in the U.S. and opened its first Winnipeg location in 1969 at the Westdale Shopping Centre on Roblin Boulevard in Charleswood. Unlike Mac's, 7-Eleven had their stores custom-built with large parking areas so it took longer for it to grow a large presence in the city. Mac's strength was in its hours: open 9 am to 11 pm, 365 days a week. It carried a wide variety of products but its staples were milk and bread and it even had its own Mac's line of phosphate-free laundry detergent and dish soap. 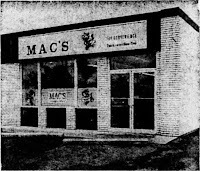 The first thirteen stores were corporate owned and overseen by regional manager Ray Pylypiw at Mac's regional headquarters on Barry Street. The plan was to sell another ten as franchises by the end of the year. Mac's predicted it would have 80 locations in the city by the end of the decade but appears to have peaked in the early 1980s with nearly 30 stores which is about the number 7-Eleven had at the time. By 2000, there were 26 Mac's stores in the city. A sad fact about the proliferation of late night convenience stores is that they were a target for armed robbers. In December 1985, Mac's employee Raj Bahri was stabbed to death during a robbery at the Burrows and Keewatin store. The 33 year-old, who left a widow, a two-year-old and a two-week-old child, was relieving his brother early so that he could go to the Mac's corporate Christmas party. In 1999, Alimentation Couche-Tard of Quebec purchased the Mac's chain and replaced MacTavish the cat with their own Hibou, the couche-tard (night owl). Four years later, it acquired the Circle K chain and in 2015 announced that it would begin rebranding its growing collection of retail chains located outside of Quebec under the Circle K banner.